Why Watch Whales in Gloucester MA with Cape Ann Whale Watch? Why choose cape ann whale watch? 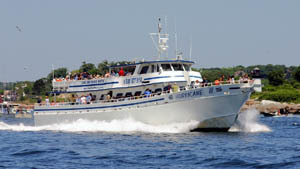 We feature the largest and fastest whale watch vessel in Massachusetts, north of Boston. We are the pioneers of whale watching in Gloucester, MA and North of Boston since 1979. We are celebrating our 35th anniversary of watching whales. We are the most experienced, dedicated and committed whale watch company in Massachusetts. While there are many companies to choose from, our highly qualified captain and crew separate us from other Boston area whale watches. Meet our highly professional, experienced crew. Best educational whale watch for adults and children alike in Massachusetts, North of Boston. We are the only whale watch in New England to have an educational curriculum designed specifically for whale watching. We hope to entertain and educate you on your trip so you gain a greater respect for the oceans and the whales. Our sightings guarantee: We are so confident in our ability to find whales, we guarantee it. If you do not see a whale with us, you may come again FREE FOR LIFE until you do. We do not consider this a gimmick—it is our passion to show our guests these gentile giants, and share an experience of a lifetime. Our 98% success rate is due to our location, speed, and local experience - for 35 years and counting.